Our customers demanded us to share the top selling food items so they can explore new foods and tastes. 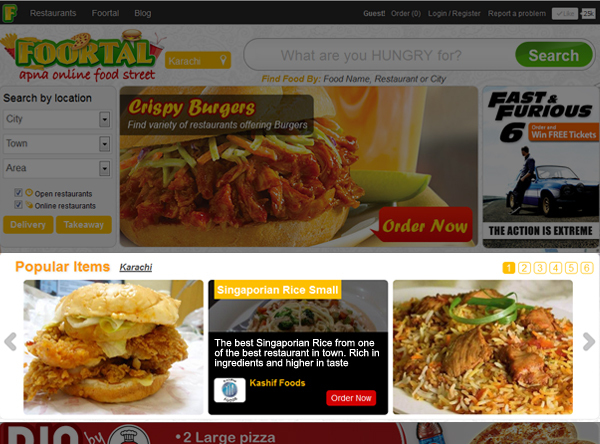 At Foortal, where customer is always first, we added a new section that will show the top selling items of your city. The list shows one top selling item of every restaurant. This is the easy and convenient way to get information on the famous food on our Foortal.pk website. Food ranking in this section is based on the maximum purchased item by customers. The results are updated every day. You can click on Order Now, which will put the item directly in your checkout basket. This entry was posted in Latest and tagged Islamabad, Karachi, Lahore, Online Food Order, Order Online, www.supermeal.pk by . Bookmark the permalink.